I don't know if you saw the keynote in March and how great (Apple said) the smart cover is. They even made the point that the smart cover is magically cleaning your iPad. Look at my picture below. Do you see the three stripes going over the screen. These stripes are exactly where the folds of the smart covers are. Do you call this clean or smart? And the worst part is, that I can't get the stripes away. Apple seem to know about this issue and took the advertisement for cleaning the screen out of their website. I have the smart cover less than two weeks and I am everything but impressed. It does not feel good in your hand when folded back, despite Apple is advertising. So your iPad still looks and feels like an iPad — just with a little extra protection. Even better, the Smart Cover doubles as the perfect movie-watching, game-playing, web-surfing, do-it-all companion. It folds in all the right places so you can quickly create a stand that holds iPad upright. Or one that lets you tilt iPad into a comfortable typing position. If you prefer to hold iPad, the Smart Cover flips back and out of the way like a page in a magazine. And if you want to shoot some HD video on the fly, the Smart Cover folds in half to expose the back-facing camera. Now that’s something to smile about. Try all this and you need a diploma to do it. It is everything but easy to do. Then the whole magnet idea. 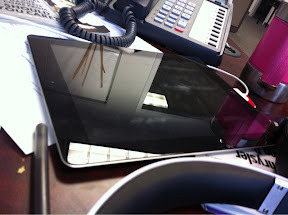 It seems a great idea, but unfortunately the magnets seem not strong enough when you hold your iPad like an open book. The cover falls easy down. At the end, a cover should cover something meaning protecting the iPad. But this cover is more a fashion statement than a protector. It does not cover others than the screen and is no protection against coffee spills or falling down from table. The cover is priced between $39 and $69 depending on material. The smartest on the smart cover is how Apple can generate with one product more revenue than most companies with all their products. Assuming Apple will sell 36 million iPads this year, the smart cover could generate around $1.2 billion in revenue for Apple. What a smart move from Apple to sell their own smart cover. I ended up and ordered my online a case, will see how this will work. * Based on an estimate of 40 million iPads sold in 2011 and an average price of $48 (70% polyurethane and 30% leather mix), the total revenue for Smart Covers will top $1 billion this year.